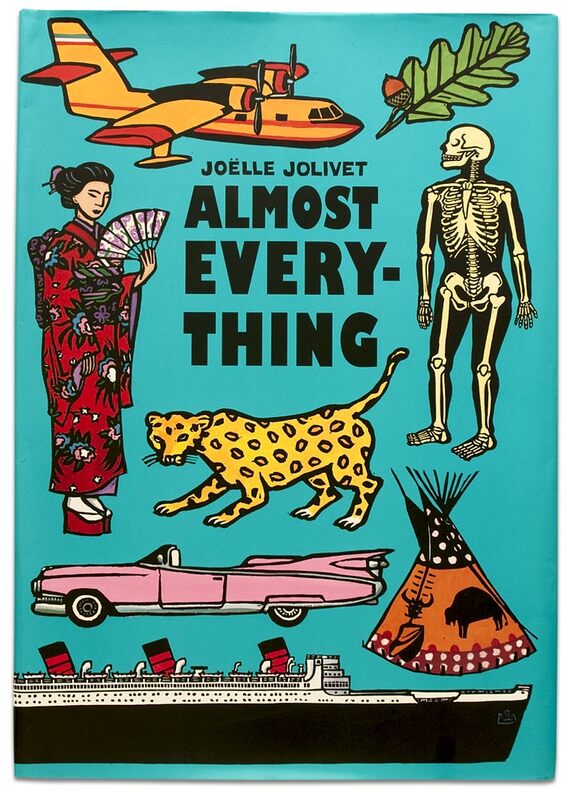 Almost Everything by Joëlle Jolivet. What are you into? What does your kid like? Maybe it’s suits of armor. Or trains. 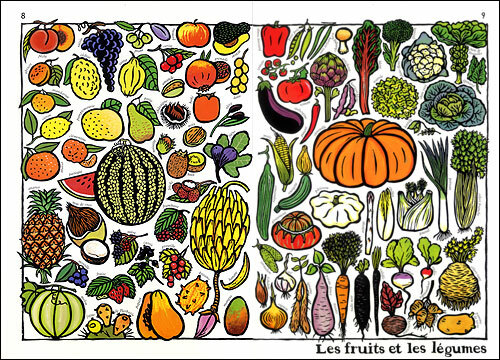 Or maybe you are working on learning different kinds of fruit. Heck, maybe boat-shaped Batak houses are what’s cool with kids these days. Regardless, the aptly-titled book Almost Everything probably covers it. Almost Everything is a huge (12×18”) picture book which features big, bold, bright, colorful images of, well, almost everything. Two giant pages featuring trees and flowers from around the world; two pages dedicated to the human body. Flip the page to find a huge spread of period costumes from across the globe. It goes on and on. It’s really quite impressive. There are other books in the series, including one all about animals and another about costumes/clothing from the world around. I only have two warnings: this book is so big (two feet across when open) that kids want to sit right on it. We have torn a few pages this way. Second: if you are going to read this book in bed, you better have a very big bed. Happy reading! Today is Friday! All the visiting family have dissipated and the missus is going out so it’s going to be a nice, quiet father-son evening in the Locker household tonight. I’m looking forward to lounging on a large pile of couch cushions on the floor, maybe enjoying some homemade pizza, and watching Ponyo with the kiddo. Technically, this is a Disney film, but only technically. Ponyo is another offering from the only anime creator I love, Hayao Miyazaki, also known for Spirited Away, Howl’s Moving Castle, Princess Mononoke and may others. Like all his movies, it’s a little bit magical, a little bit weird. Like many, it deals with the collision of the spiritual/natural world and that of humans. 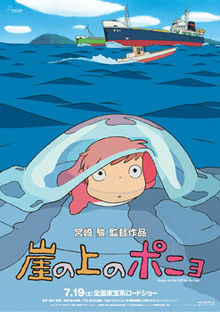 Ponyo is a little fish girl who lives with her father and siblings deep in the ocean. Driven by a desire to explore, she finds herself trapped in a bottle by the shore. A little boy named Sōsuke discovers her and names her Ponyo. Little does he know this little fish is a magical girl. When her dad has Ponyo returned, she refuses to stay and goes back to Sōsuke, only in human form. There is so much more that happens and my meager summary would not do it justice. Just go watch it. Try not to get pizza crumbs on the couch cushions. This week I’ll introduce you to a sleep tip that many of you are probably aware of, but do not practice: keeping the phone (and other electronics) away from the bed. I often think, as do a lot of people I meet, that sleeping with the cell phone, tablet, or other electronic device by the bed is bad for sleep. Why? Because, with your phone at an arm’s length away, we are constantly tempted to check our email or read an excessive amount of news before bed—electronics enable the insomniac in all of us. To help reduce the negative consequences of sleeping in an ever-connected, 24/7 world, I’ve put together three steps to help you get the good night’s sleep you’ve been craving. The first way that electronics affect sleep is by exposing us to unnaturally bright light after. Light inhibits the body’s release of melatonin, a hormone that promotes sleep. This is a natural reaction, and is what helps our bodies stay awake during the daytime; however, when you introduce artificial light after the sun has gone down, your body is tricked into thinking it should still be awake. We all have different light sensitivities, and I didn’t notice the effect until I started reading under a full-spectrum light. While it helped with Seasonal Affective Disorder (the winter blues), it kept me wide-awake and alert far past my bedtime—more than any amount of coffee ever could. I touched on this idea a while back in an article about color shifting your computer screen for better sleep. This little trick not only helps alleviate eyestrain, but it also helps your body prepare for sleep. To further resolve this problem, try setting an electronics curfew for yourself. All you need to do is have the discipline to cut out your use of electronics 60 to 90 minutes before you go to sleep. Easier said than done, I know. 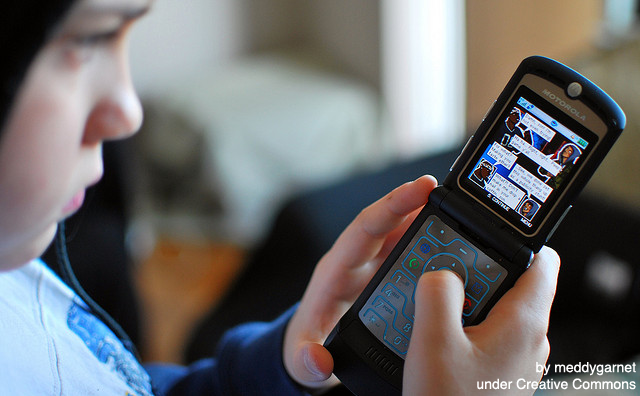 Even if our bodies didn’t respond to bright lights, electronics affect us psychologically with the media they display. Have you ever found yourself unable to sleep after a scary movie? It’s likely due to the adrenaline your body produces in its natural fight-or-flight reaction. 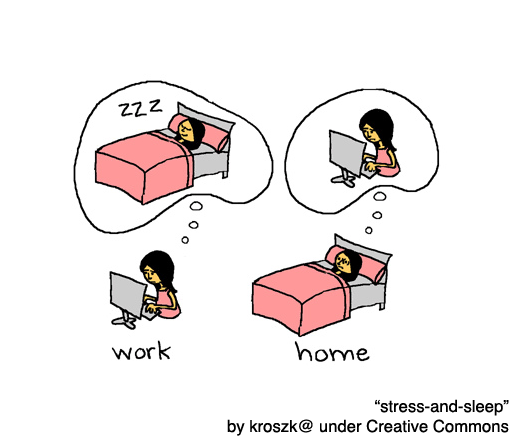 Eliminating stress and anxiety triggers before sleep should help your mind stay calm and collected—an essential ingredient for a good night’s rest. So even if you can’t pry yourself away from watching another episode of your favorite show or reading that last-minute email, save the stressful stuff for the morning. If you’ve been unable to get that restorative sleep you’ve been aiming for, the problem might be sitting right next to you. And even if you aren’t actively using electronics before bed, they can still disrupt your sleep. Anything electronic produces electromagnetic radiation (EMR), which affects your body’s production of melatonin and serotonin. EMR is also thought to make us more sensitive to the fight-or-flight state, which is otherwise caused by psychological triggers like a scary movie or an upsetting email. This is known as the “wired-and-tired” effect, and is one of the reasons we find ourselves awakening from a long sleep, but still feeling exhausted. To reduce your exposure to EMR, try moving your electronics as far away from the bed as possible. While it may take a few weeks, or even months to see results, the long-term benefits will be well worth it. After all, there is nothing natural about sleeping next to a cell phone. Kevin and I took an old-fashioned vacation this summer. We unplugged our electronics, stocked up on books and movies, and hopped in our car for the five-hour drive to Vermont. Our “private camp” (otherwise known as a cozy little house) was nestled up tight against the banks of the bountiful Lake Champlain. We had envisioned lazy days sunning on our tiny shale beach, punctuated only by cooling dips in the lake or sunscreen breaks. Instead, we arrived to a mighty, swelling lake, soon to reach its 100-foot flood mark level, and rainy, rainy days. So I scouted out the best spots for farm fresh produce, local dairy products and my all-time favorite Vermont comestible – maple syrup. Then I moved my activities indoors to the small kitchen. 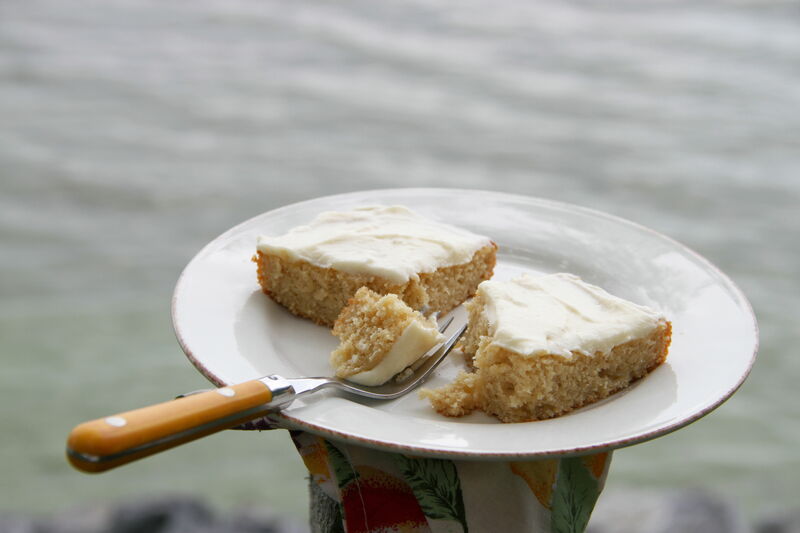 Perhaps slightly decadent for daily breakfast, this Maple Morning Cake seemed fitting for our sleepy vacation. Lightly sweet, the rich, mellow maple flavor shines through. Skip the buttercream frosting, if you like, and sprinkle the top with some maple or cinnamon sugar. Cool lake breezes, pattering rain, and blessed silence had us sleeping soundly, dreaming only of the morning ahead and our Vermont maple-y breakfast in bed. Preheat oven to 350°. 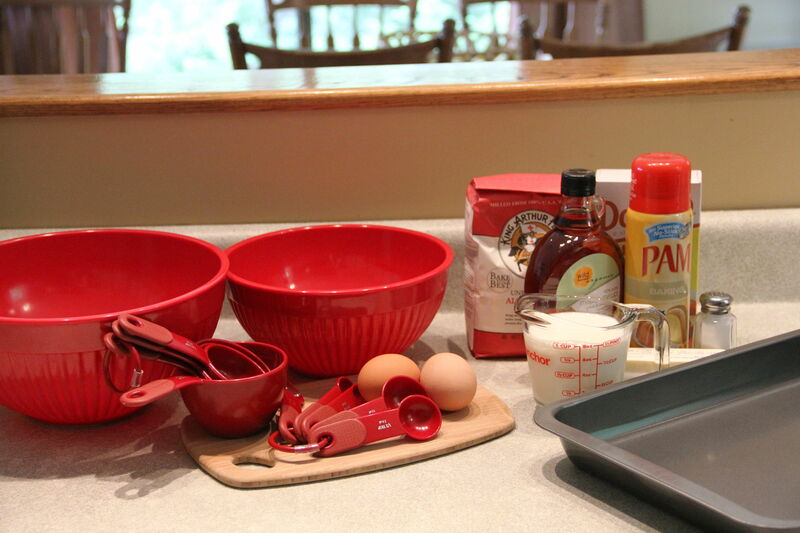 Grease a 9×13-inch baking dish and set aside. In a large bowl, cream together the brown sugar and butter. Beat in eggs one at a time. In a separate small bowl, sift together the flour, baking powder and salt. Mix the milk and maple syrup together in another small bowl. Add alternately with flour mixture to the egg batter, until well mixed. Fold in sour cream. 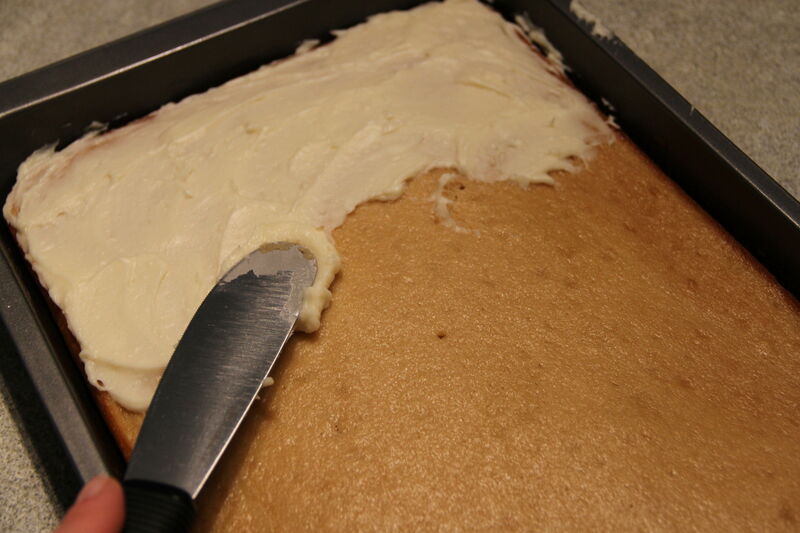 Bake for 30 minutes, or until a toothpick inserted in the center of the cake comes out clean. Cool for at least one hour before frosting. 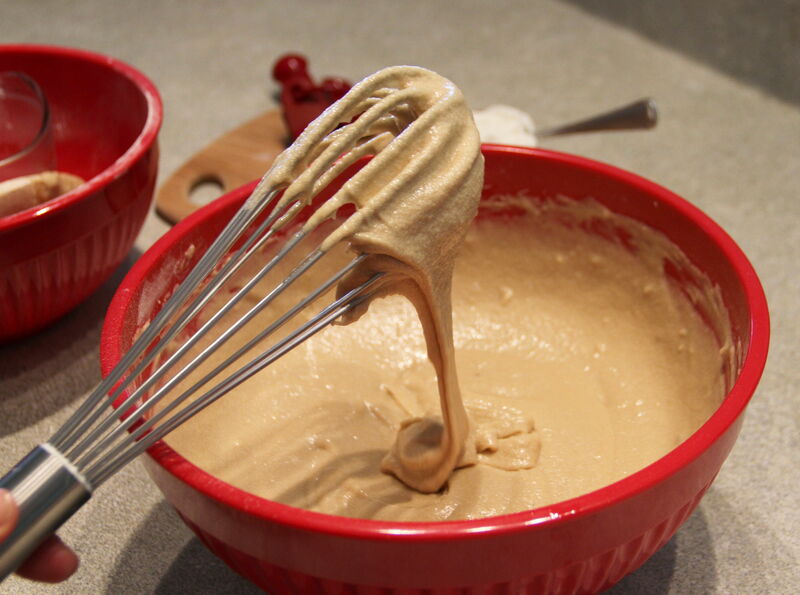 To make frosting, mix softened butter and confectioner’s sugar together until well blended. Stir in maple syrup and milk, mixing until smooth. 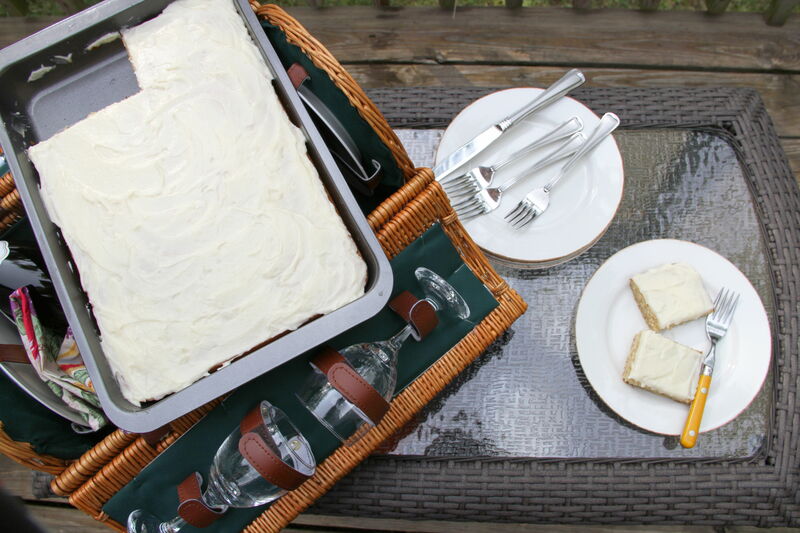 Apply a thin layer of frosting to cake using a butter knife or spatula. Refrigerate cake until ready to eat. 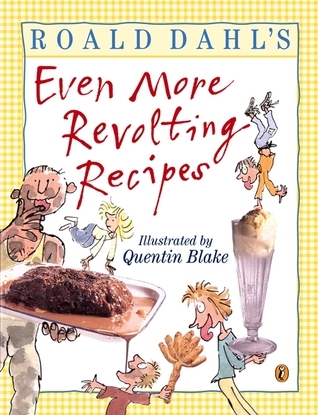 Even More Revolting Recipes inspired by the stories of Roald Dahl. 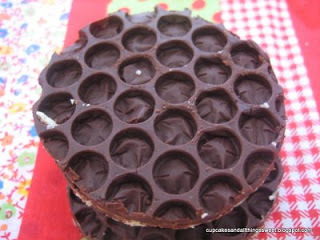 My response is: who doesn’t want to be lulled to sleep with visions of delicious, gooey delectable treats? Rivers of fudge and fluffy marshmallow clouds? C’mon! Plus, all the recipes in this series are inspired by delectable (and sometimes disgusting) descriptions from Roald Dahl’s stories. From “Hornets Stewed in Tar” to “Tongue Rakers” to “Noshnibblers” the variety of names and dubious combinations is actually a pretty entertaining read. Each recipe is accompanies with an excerpt from his stories, from Charlie and the Chocolate Factory to The BFG to a bunch I’ve never heard of.